Preparation for Broth. 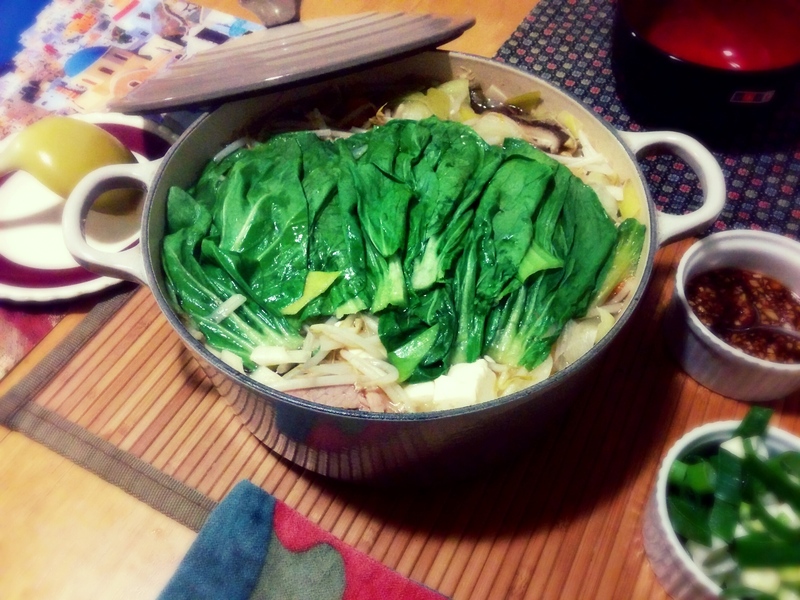 Put 1000cc of water in a Nabe Pot (or clay pot, or deep casserole pot). Place Dried Kelp in the water and soak it for about 30 minutes. At the same time, reconstitute Dried Shiitake Mushrooms in 500cc warm water by soaking for about 10 minutes, or until they become soft. Once Shiitake Mushrooms are soft, remove the stems and slice them in half. Keep the soaking liquid. Add the Shiitake’s Soaking Liquid, Garlic, Ginger, Cooking Sake and the hard green part of Leak in the pot and bring it to boil. Once the water is boiled, remove the Kelp and Leak. Reduce the heat to medium. Marinade Chicken Breast with Soy Sauce, Cooking Sake and Salt. Rest the Chicken in the fridge until it is used. Once the broth is ready, add Shiitake, Leak, a hard part of Bok Choy, Onion and 2 Tablespoon of Sesame Oil. Put a lid on and add continue cooking until the Bok Choy becomes soft. Add Pumpkin, Carrot, Chicken (with the marinade liquid) and Tofu. Put a lid on and continue cooking until Pumpkin becomes soft. Put Bean Sprout and the Bok Choy leaves on top and add 2 Tablespoon of Sesame Oil. Put a lid back on and cook for another 3-5 minutes. While it is cooking, make Sauce by mixing all ingredients of Sauce. 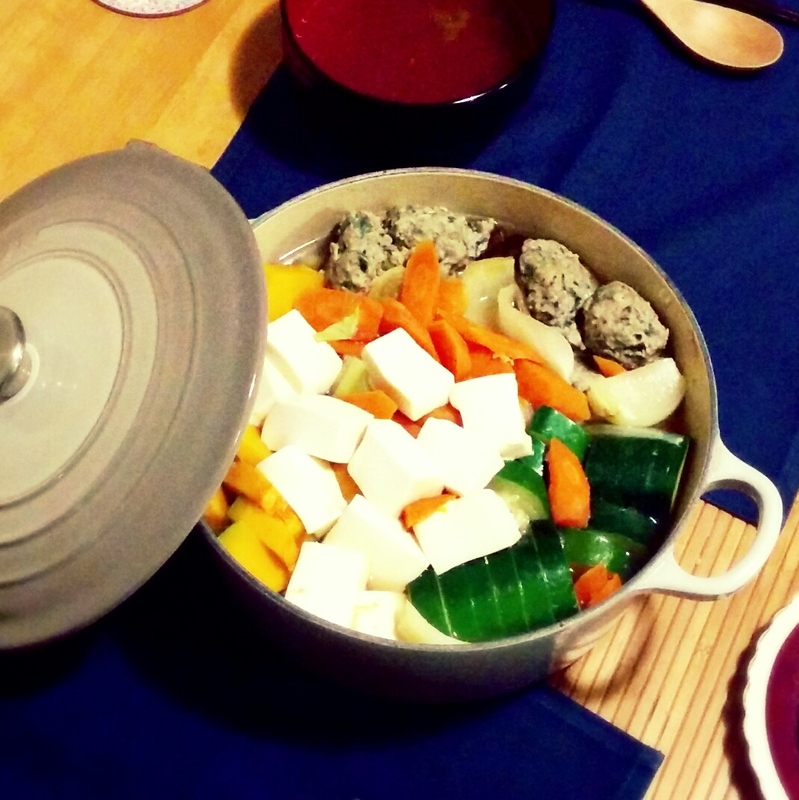 When you eat, put a small amount of Sauce in your serving bowl first and add the Nabe’s ingredients and soup in it. I would recommend 1/3 teaspoon of Sauce to 1.5 ladle of Soup, but it is totally up to you. Start from a small amount of sauce and add more if you like. Put some chopped Spring Onions on top when you eat. 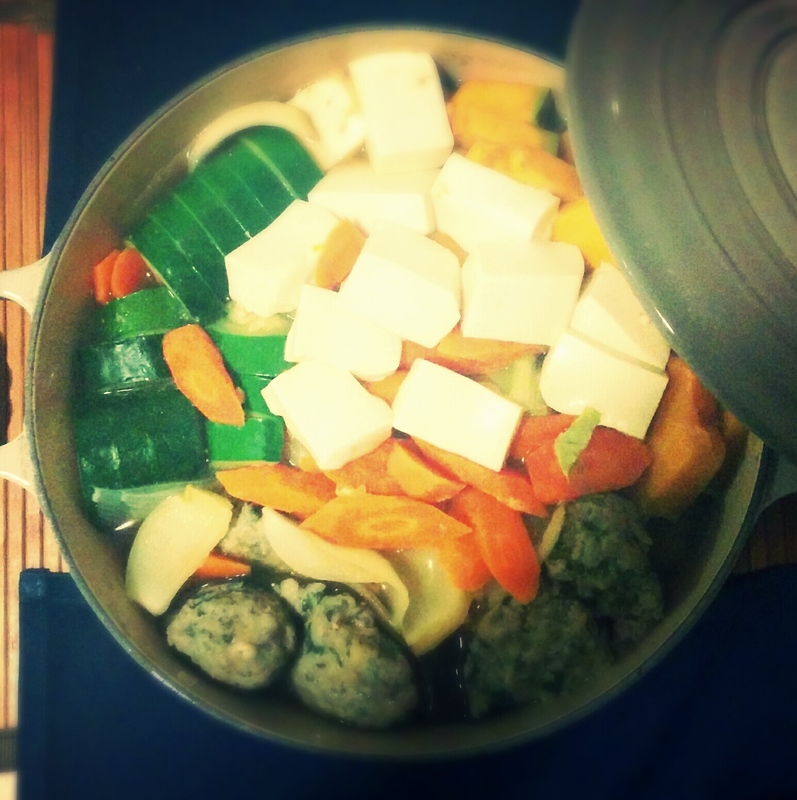 Put water in Nabe Pot (clay pot or deep casserole pot). Place Dried Kelp in the water and soak it for about 30 minutes. Heat the pot and bring it to boil. Once the water is boiled, remove the Kelp. Reduce the heat to medium and add Chicken Stock, Soy Sauce, Cooking Sake and Mirin. Prepare Chicken Meatballs. Add all ingredients for meatballs in a bowl and mix them well by hand. Put it aside until the broth is ready. Once the broth is ready, put the Chicken Meatballs in the broth. Use 2 Tablespoons to make a small ball and drop it into the broth one by one. The meatballs will come up to surface once they are cooked. Once the meatballs are cooked, add Vegetables in the pot. Add Vegetables which take longer to cook first, such as a hard part of Cabbages, Carrots, Leeks and Celeries. Once these vegetables are cooked, add Tofu and softer Vegetables, Such as Onions, Zucchinis, leaf part of Cabbages. Simmer until all are cooked.